The Sign Maker for the very best in Bespoke House Signs : We make Celtic House Sign and Name Plates in a huge variety of materials. 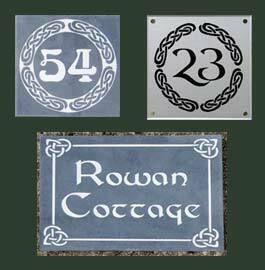 We have a whole collection of beautiful Celtic Borders and Celtic Symbols which can be incorporated into any of our house signs and name plates. 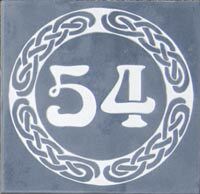 Use these with one of the Celtic fonts to create a truely unique sign for you house. 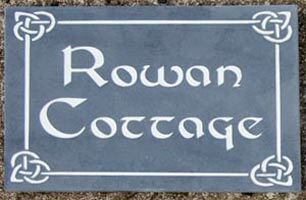 Slate is one of the materials most used for a Celtic style house sign and there are several examples shown below. They can have the letters engraved out and painted or the background can be blasted away leaving the letters and border raised. We can even do a combination of both - See the example - SEVEN - below. If the images you wish to use are too detailed for slate we can use slate corian which looks just like slate. Click the links above for prices or ask us for a quote. Other signs particularly suitable for the celtic designs are wooden, clear acrylic, reflective and engraved dark bronze aluminium. They also look fantastic as window art using sand blast effect vinyl. 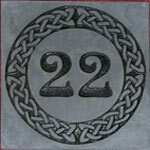 We have a large selection of celtic borders - click here. Only the boldest designs can be used for sand blasting, most can be deep engraved and those with very fine detail need to be laser engraved onto wood or aluminium. We also have a good selection of Celtic Symbols - Click Here. As with the borders only the bold designs and be sand-blasted. Made in the UK. 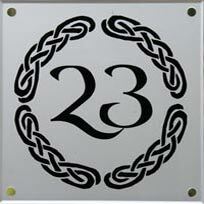 Our team at The Sign Maker looks forward to helping you with your celtic style house sign.